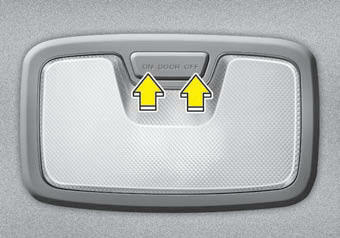 DOOR : In the DOOR position, the map lamp and the room lamp come on when any door is opened regardless of the ignition switch position. When doors are unlocked by the transmitter (or smart key), the map lamp and the room lamp come on for approximately 30 seconds as long as any door is not open. The map lamp and the room lamp goes out gradually after approximately 30 seconds if the door is closed. 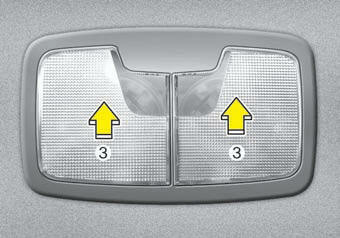 However, if the ignition switch is ON or all doors are locked, the map lamp and the room lamp will turn off immediately. If a door is opened with the ignition switch in the ACC or LOCK position, the map lamp and the room lamp stays on for about 20 minutes. However, if a door is opened with the ignition switch in the ON position, the map lamp and the room lamp stays on continuously. OFF : The lights turn off even if a door is opened. ON : The room lamp stay on at all times.